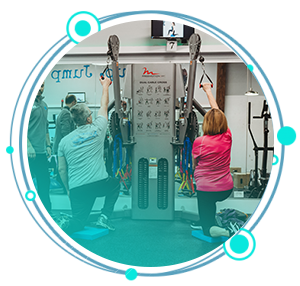 Each week, we offer challenging and effective fitness stations that focus on cardio, weight training, flexibility, and core strengthening. Workouts at Circuit 31 Fitness are tailored to be fun, increase energy, and deliver results. Our mission is to help others become their best selves by achieving their fitness goals one workout at a time. Become a member today and revive your fitness journey—we’d love to welcome you to the Circuit 31 Fitness family! Show up whenever you’d like—there are no class times! Heart rate monitors will help you track and stay in your target fat burning zone. Each station is equipped with a video to help guide you through the exercise and provide ways to tailor to each fitness level. When you hear the buzzer, continue to the next station. Every day, stations change to provide a well-rounded fitness routine that delivers results!